New York is a haven for cinephiles, with a bevy of boutique and intimate screening rooms to catch the latest, rarest, or vintage flick. With the beloved Roxy Cinema now on the scene, we rounded up a full-bodied list of other theaters around town that promise the same close-knit feel, unique experience and eclectic screening offerings. Designed to evoke an Old New York theater feel, Roxy Cinema offers an extensive program of first-run, independent, classic, art house and foreign film – all coupled with a gourmet concession stand offering candy and popcorn, as well as beer, wine and champagne (cocktails coming soon!). Returning in June will be an assortment of children’s programming that will run on weekends. For the entire summer, Roxy Cinema has also announced complimentary entry into midnight screenings and free entry to all students! Alongside regular programming, Roxy Cinema hosts a number of private and public events that wrangle a diverse crowd across music, art, design, fashion and culture. With just 99-seats, there isn’t a bad view in the house, and unlike other theaters, tickets are just $10, and free to all Roxy Hotel guests. Tucked into the now bustling southern tip of Ludlow Street where the Lower East Side meets Chinatown, Metrograph is a curated world of cinema that pays tribute to the grand movie houses of the 1920s. Movie mavens can experience archival print screenings, as well as contemporary flicks, plus special events, dinners, book signings and events. Grab some sweets from the candy shop for the movie, or come early to experience The Metrograph Commissary, a restaurant inspired by golden age Hollywood studio eateries. The center for a true film buff, Anthology Film Archives is not just a place to check out a rare film, but also a place to learn about indie, experimental and avant-garde cinema. Opened in 1970, it was originally meant to be a museum, but instead has become a place to experience cinema history. Their film schedule is a veritable full spectrum of cinema- from early silent film to Surrealist cinema to modern indie flicks, premiers and a special New Filmmakers series that fosters the future of film. Originally a movie rental store (until Hulu, Netflix and HBO Go moved in), Videology turned its aisles of DVDs into a bar, but kept its movie-fan roots. Now the micro-cinema hosts regular screenings in its 40-seat theater, often in cute thematic nights that pair movies with movie-inspired cocktails (like a Dazed and Confused Kegger, and Dirty Dancing with Watermelon Margaritas). There’s also a front bar for post-movie discussions over cocktails and snacks. With locations around the country, Alamo Draft House is another example of the boutique cinema trend, offering assigned seats with tables, as well as waiter service during films. The cinema screens both new and cult classic movies, and offers up a full bar and food- serving up their popcorn menu in giant metal bowls like your mom used to make. The experience is even more cinematic thanks to their in-house bar, The House of Wax. The bar, available before and after your screening, is stacked with wax relics of medical oddities, death masks, anatomical studies and ethnographic waxworks derived from Castan’s Panopticum from 1869-1922. The original center for independent and foreign films, the theater opened as the Angelika Film Center & Café in the gorgeous Cable Building in 1989, when the Noho/Soho area was a burgeoning arts center. The theater continues to show a mix of indie and foreign films as well as Q&As with directors and actors. The Angelika can also boast that it is the most recognized arthouse in the United States. 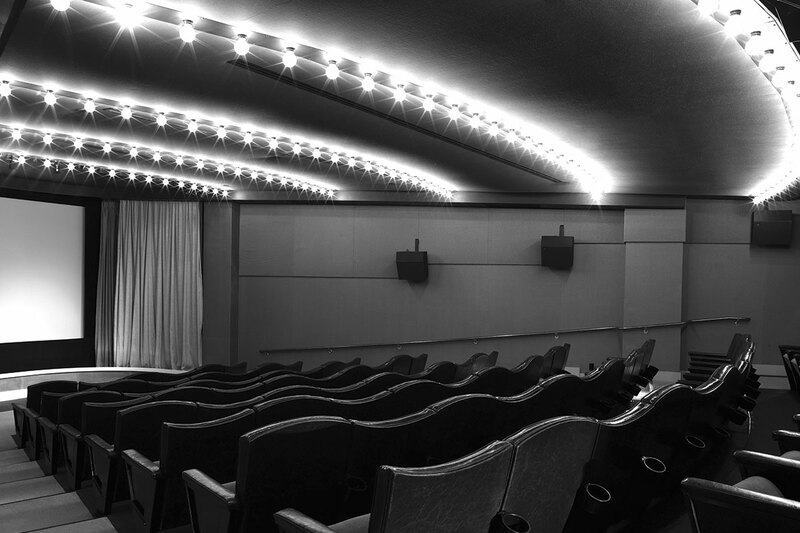 Home of the Tribeca Film Festival, the screening room is open for private rentals, but also often hosts one off screenings by various film groups around New York and beyond.